The answer is "Probably" as 5th Passenger stars four (count'em) FOUR Star Trek luminaries in the form of Tim Russ (Tuvok), Marina Sirtis (Troi), Robert Picardo (The Doctor) and Manu Intiraymi (Icheb) plus some Hellboy actor Doug Jones and even more faces from the sci-fi universe to boot. Ok, here's the spiel in a couple of lines - Four crew, one escape pod, a pregnant officer, a lack of air and a mysterious fifth passenger who gradually picks off our well-known cast one by one. It can only mean it's going to be a race against time to get it before it gets them mixed in with a spadeful of conflict. Pre-production is well underway and the Kickstarter project is in full swing with just two weeks left to run. $41,000 of the $65,000 has now been raised to make the movie viable and full pre-production can begin once the target has been met which looks like a real possibility. "The fundraising is going well but we will definitely need more support if we are realistically going to make this initial goal." said cast member and writer, Morgan Lariah, "We really believe in this story and we know this film is something our audience is to enjoy." With perks such as PDF scripts, access to donor-only groups, exclusive content, digital movie downloads, DVDs, lunches with crew and cast, names on end credits, costumes, miniatures (running out of breath...) and more and more, it's one of the more fan-friendly productions ensuring that backers are getting a lot of bang for their buck. Explained writer/director Scott Baker, "I always have little seeds of ideas jumping around in my head. I really love The Twilight Zone and the way Rod Serling would tell stories and the core of this film is very much inspired by all the episodes of that show that I have watched." "My friend Philip and I were chatting up ideas and bouncing different things back and forth when one of the little seeds came out. I wrote up a few scenes from it and took it to a table read session and the others really liked them, so I set in to flesh out the entire story." Morgan was hooked very early on; "He approached me one day, told me the premise and how I would be great for the role of Miller. I was hooked!" The big thing that will attract Star Trek fans to this project and certainly caught our eye was the unmistakable cast. "Scott met Manu Intiraymi on the set of another production and they chatted." recalled Morgan. "Scott mentioned 5th Passenger and how Manu is perfect for the role of Thompson." 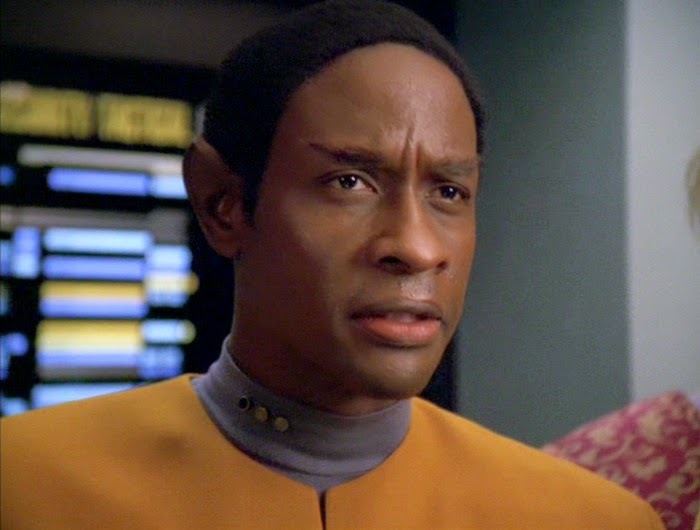 Manu, who is also starring in the Tim Russ web-series "pilot" for Star Trek: Renegades loved the script and suggested the Tuvok actor for another of the parts in the movie, that of Franklin. "Tim joined us for the filming of the trailer. He recently helped to get Marina Sirtis and Robert Picardo on board as well." enthused Morgan, "Having iconic Star Trek actors wasn't something that Scott and I initially planned but knowing these actors and their work we couldn't be happier with the cast we have. I can’t wait to see how they bring these roles to life." Morgan herself was always slated for the key role of Eve Miller and recently started writing and producing her own projects such as the short film, 2-Star (which she co-wrote, produced and starred in) at the East End Film Festival in London and then went on to several other festivals internationally and in the United States. "I think we are so lucky to be living in this era where we have access to the equipment and technology that others before us could only dream of. Being on set with Tim Russ and Manu Intiraymi to film the trailer was such an incredible experience. They are such amazing actors and I loved watching their process. I can only imagine what acting alongside Doug Jones, Robert Picardo, Marina Sirtis and Hana (Molly O'Brien) Hatae (recently added to the cast) will be like but I am greatly looking forward to collaborating with them." But it's not just about the wonderful world of Star Trek and while that is our main focus here(!) there are cast and crew who have been associated with films such as Captain America, Tron Legacy, Donnie Darko and series including Buffy the Vampire Slayer. It certainly looks like something which has brought together a bundle of experience from all corners of the sci-fi genre. Among those luminaries is visual magician Tobias Richter who has been seen bringing something amazing to the Axanar project in recent months. The trailer itself is dark, brooding and atmospheric. 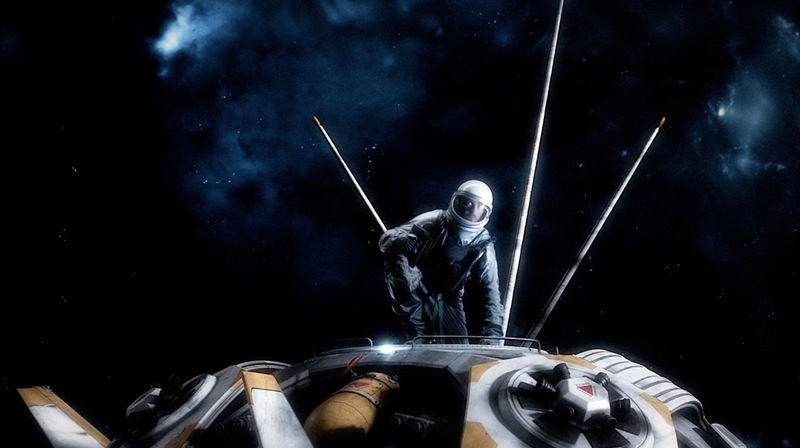 If you're looking for a comedy element or a nice easy diversion then this won't float your boat but for those of you who like your sci-fi in the gritty tone rather than light and fluffy it'll be on your must-see list from this moment onwards. Seeing Star Trek actors facing off against each other rather than being all pally-pally makes a refreshing change and is out of the comfort zone in which we fans would usually see them. As trailers go there's not a lot given away but we go get to understand the filming style, a sense of the narrative and dialogue and a few shots both internal and exernal activity to keep you locked into your seats and more importantly helping fund this imaginative project. Initially planned as a one-off ("You never know what will happen," said Scott), original movie, this was envisaged partly as a break from the explosion of superhero movies we've experienced in recent years; "Studios don't want to take chances on something new and I get that. They want safety. But that's where we come in. We are not beholden to men in suits who only see numbers." said producer Scott, "We are looking to the fans of sci-fi and horror who want really new content. People vote everyday on what they want by where they spend their money. We're asking people to look at what we're doing, and if they like it, vote for us. We will deliver something amazing and NEW." And on that one-off possibility, Morgan also wasn't sure if this would be the characters' only outing; "It’s funny because Scott and I know these characters so well. We know their past like our own and have mapped out their future. 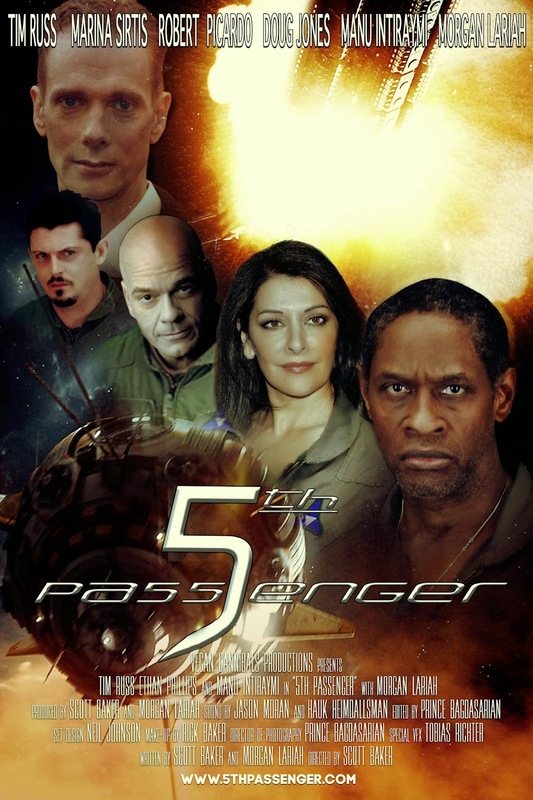 5th Passenger only explores a sliver of their lives. We get to see and experience them just for this particular moment in time. If this first film is successful, we certainly can explore more of this universe with these characters." It is still early days for the project but the Star Trek community is sure to be onboard with such a headline cast and knowing that in the background are some of the great heavyweights of the sci-fi movie industry itching to get started. I can only imagine that these characters will be worlds away from Icheb, Molly, The Doctor, Troi and Tuvok and will make compelling viewing in every sense. Closed Morgan; "I think those who believe in the importance of strong female leads, diversity in casting and a captivating story will want to fund this project. I believe so strongly in making films that portray different aspects of the human condition, this is one of them." Wanting to find out a bit more? 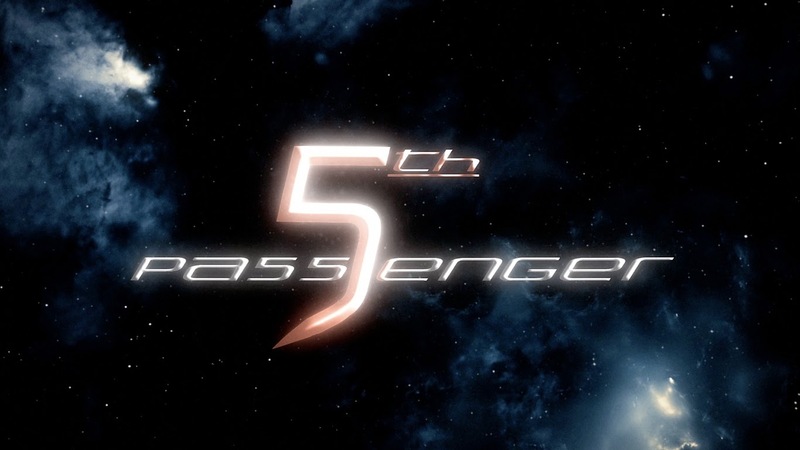 Try out the 5th Passenger website or head onto their Kickstarter campaign and help fund the project. "Hey," said Tom; "I've written something on one of the movies I watched last night...what do you think?" How could I refuse and it's certainly one we've barely touched since the start of Some Kind of Star Trek. 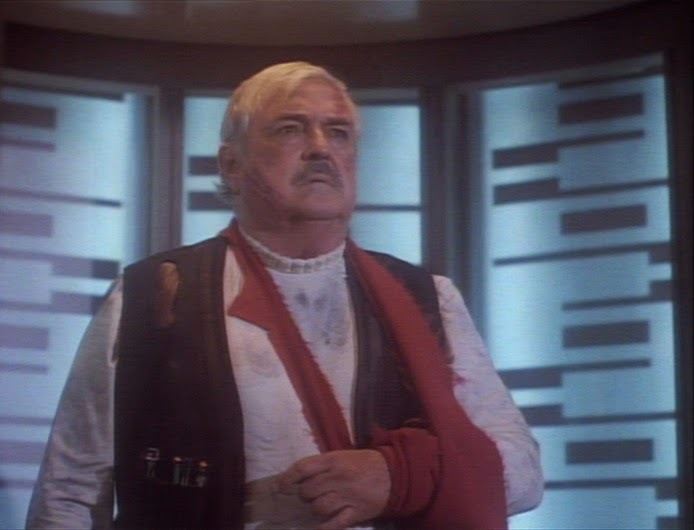 The first Star Trek movie without Kirk on the Enterprise, the classic crew resolves to return to Earth to face the consequences of their actions - in a Klingon Bird-of-Prey. What?! A bit of the plot is unveiled below for those of you who haven't see it or wanted a refresher, but first a little bit about my time with the Star Trek franchise. The first time I saw this movie I was a very young boy, and I don’t remember much. I remember it was my favorite of the original movies, and I remember it was because they went back to Earth in our current time period. While I’m sure that helped with the costs of filming this movie, I thought it added something different to the franchise. Perhaps it was foretelling the impact time travel would have on future series, like Enterprise, but I certainly enjoyed it. As the crew departs Vulcan to stand trial for their actions in the rescue of Spock’s body, they discover that some alien device, resembling a large piece of lead from a mechanical pencil, has attacked Earth, beginning to vaporize the world’s oceans. Spock quickly determines they are trying to garner a response from the long-extinct humpback whales, so now-Admiral Kirk determines that the easiest way to solve Earth’s dilemma is to go back in time - by flying at warp nine around the sun (first seen in The Original Series' Return to Tomorrow) Again, what?! I appreciate Trek quite a bit, mostly for the fact that a majority of it is based in science fact, not pure fiction - but this one tops the charts. 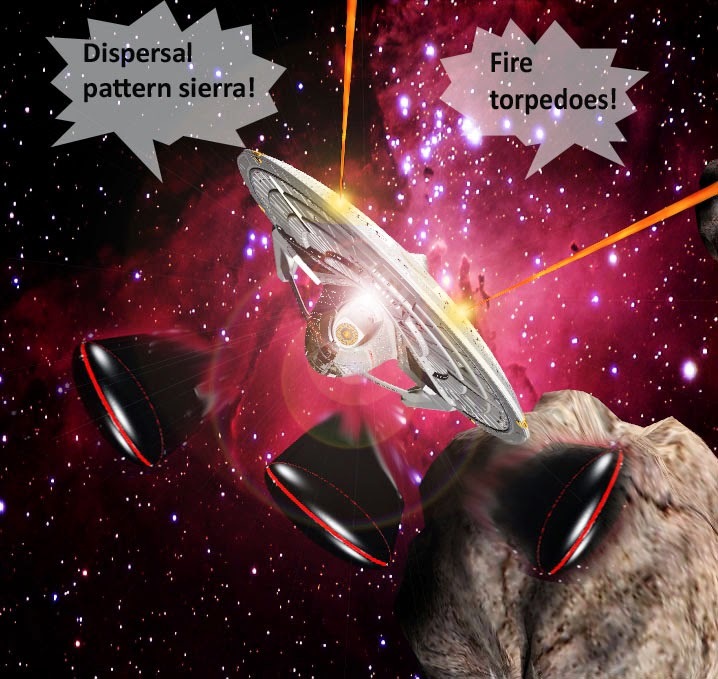 If we can use warp velocities (which exceed the speed of light) to travel between distant stars, then we most certainly cannot use the same warp drive to slingshot around a star and go back in time - and certainly not go forward in time by doing it in the opposite direction. In the end, Kirk gets demoted back to Captain and given command of the new USS Enterprise, NCC-1701-A, a move that’s sure to win fans over (and a lettering system that would influence The Next Generation to go for "D" rather than "7"). This movie is one of my favorites for the story, but one of my least favorites for the execution. Kirk and his cadre give away the formula to transparent aluminum to obtain enough plexiglass to build a whale tank, and they take someone from the 20th century back to modern times, but no trouble there is mentioned - not the Prime Directive or anything else. It’s obvious this movie was made more for the fun of the audience than anything remotely relating science fact or canon Star Trek rules (or you can simply attribute it to Kirk always getting his way). Last gripe of mine - sound can’t travel through space, so how in the heck was this alien race communicating with the whales? No explanation given - ah well - but still, like all Star Trek an enjoyable show. This movie is still, with her flaws, my favorite of the original six. Watching this movie for a second time now, one where I’m still in the US Navy, I can’t help but smile when we hear Chekov asking where the American ‘nuclear wessels’ are, especially considering I now operate one of those vessels. 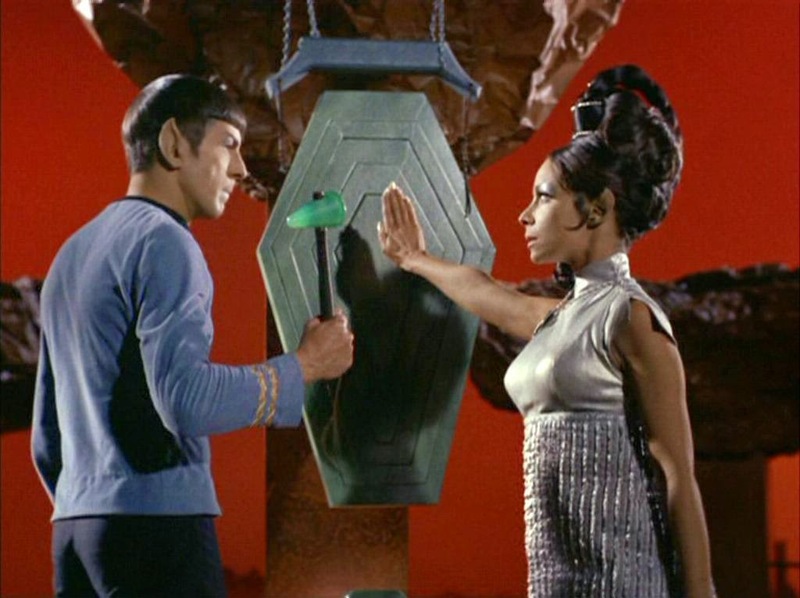 Watching things a second time in Star Trek has given me a much greater understanding of the deeper meanings behind things, and in The Voyage Home, there’s plenty to notice that will make this a good watch for anyone again. Ahhhh. Star Trek IV. The first Star Trek movie I ever saw at the cinema and right confused the hell out of me since I'd not seen The Search for Spock and suddenly we were on Vulcan with a Klingon Bird of Prey and the crew in a whole heap of trouble. I was seven(ish) and living in Cornwall when I saw this and didn't really get it. 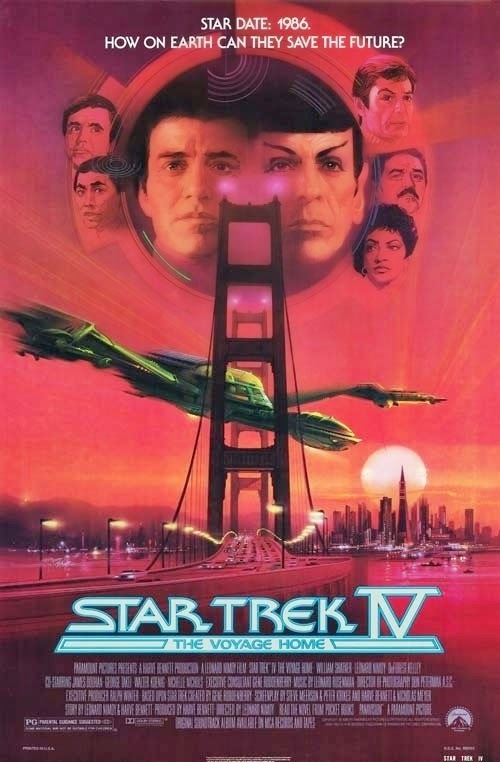 There were no space battles, no big set pieces and it was played a lot less seriously than The Wrath of Khan and was a lot more environmentally friendly and they saved some whales. I was a bit disappointed since the recap at the beginning showed lots of top action stuff from the previous two movies. Sigh; at least there would be a cool new movie soon with this new Enterprise and it's immaculate bridge set which burned my eyes out. Sadly we'd have to wait until 1991 to get the movie it deserved with Star Trek VI. The Voyage Home is most likely the second most watched Star Trek movie I own after The Wrath of Khan but I wouldn't place it that high in my list of favourites. It probably comes in a fourth or fifth after The Wrath of Khan, First Contact, The Undiscovered Country and Generations (yes,I do love that one more). The humour is fine but I still find that after 27 years since it's initial release in the UK in April 1987, a full five months after it's November 1986 US release, it still leaves me a little off. Also, feel sorry for Sweden who had to wait for it to come out in March 1989. It's the only movie which captures not only that key balance of elements but also provides a snapshot of the real world in which Star Trek was being developed and 1986 never looked so scary; colourful metaphors, Apple Macs, exact change buses and it's worth paying close attention to the mish-mash of characters who form the tour party at the Cetacean Institute which leads to Spock's swim with George and Gracie. It's got a lovely panning shot along the crew as the charges are read and each recalls their part in proceedings. Along with those two favourite moments there's a wonderful, unusual score notable with the fast, lively Hospital Chase sequence and also the closing credits music complete with chimes - which unusually has clips from the film for about half their running time. It is a very different sort of Star Trek movie that even the time travel element of First Contact doesn't replicate nor do any of the films ever get close to achieving the balance of humour and action that is managed here. The Star Trek Wars podcast ended their first season episodic reviews this week with Operation: Annihilate, The Neutral Zone, In the Hands of the Prophets, Learning Curve and Shockwave. But that's every single season-closing episode of every Star Trek series isn't it? Answer: Yes. That's one of the features of this hour-long podcast as they review one episode from each series each week. For example in week three they reviewed the third episode from each series and so forth. The only issues with that come towards the end of the seasons when there are a varied number of stories especially with The Original Series having 29 and Voyager only having 16 when you discount the four shows which were held over for year two (The 37's works so much better as episode 20 rather than episode one). I came to this somewhat late but with rush hour traffic lengthening the journey to work I can get through two of these shows in a day. Hosted by Jeremy Reed, son Connor and wife Gina round out the reviewing trio providing a different viewpoint on each show and each episode. So how does it work? For the most part it's a great concept. Jeremy acts as the seasoned fan, the voice of Star Trek experience while Connor provides the young, new fan seeing many of the stories for the first time. Initially Gina acts to provide the fun facts but as the show grew over the first season she became a more integral part to the discussion which I found very welcome. There's a good reason for that call. In the initial podcasts Star Trek Wars is clearly finding its feet but it sacrifices good reviewing and analysis time for plot synopsis. Jeremy does add some weight to the show but I did find Connor's basic details terribly annoying after three or four shows. I understand he's 11 but there's only so many comedy accents, poorly remembered plots, mumblings, "he said.../she said..." "and he's like..." "and then"'s that you can deal with especially when it happens over the course of five mini-reviews in 60 minutes. It's great to have a new perspective on the show and in a lighter fashion but there's nothing to balance this raw enthusiasm and exhuberance in the first four episodes. As Gina takes more time to discuss her views that balance comes into effect. She is indeed the voice of reason tragically overlooked in the early stages but making a lot of sense from their fifth show and onwards. 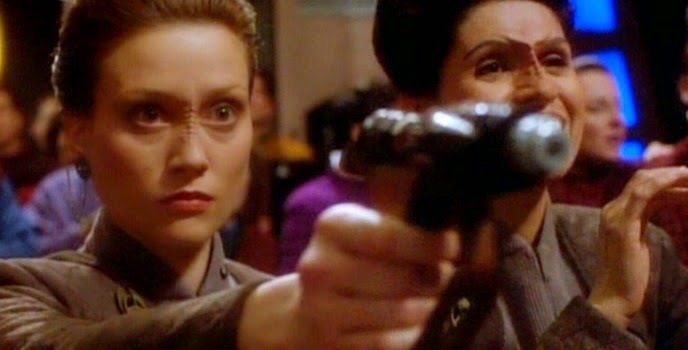 Her opinions on the first season Deep Space Nine episode Captive Pursuit are what really made me notice the difference and this is something they need to retain for season two and after. It can feel like the reviews of the five are rushed with the limited run-time of an hour and debate doesn't last that long at all once we get past the plot details. The Fun Facts are great as I've picked up several pointers from these that I'd either forgotten in the mists of time or honestly didn't know at all. If the discussion was more in this vein rather than simply plotting out the story it would enhance the show but on the flip side the various personalities and the back to basics approach does make it accessible to fans of all ages and knowledge levels. Perhaps you could watch out for spoilers though as there have been a few giveaway times that could ruin it for those who've not seen that show before (although in the case of Voyager I'm not sure you'll be too concerned during the dark days of season one). Am I sounding harsh here? Maybe but I'm not a new fan nor am I 11 so that part of Star Trek Wars does fall a bit flat for me. I suppose it's clever to offer those different entry points to the series as I do enjoy both Jeremy and Gina's input which can be overshadowed by the amazing over-enthusiastic Connor who at times the show can centre around a little too much. We know you're enjoying it but let's turn it down to 11. For experienced fans I'm sure they would like to hear more from Jeremy about his personal memories of first showings, original thoughts and a slightly more retro feel than just talking through the story. The final show of the season, focusing on the year one finales was a particularly entertaining audio journey. Aside from Voyager's season finale that's not a season finale, Learning Curve, I really like the other four as they do seem to pull out all the things you would expect to close your first year and make you want to come back for another bite in a few months time. Anyway, this was a great episode, highlighting everything that was good with Star Trek Wars - the Jeremy/Connor/Gina balance worked perfectly (and Connor has toned his exuberance) allowing for a perfect mix of long-term expert, newcomer and logician. Keeping the plot of each episode limited and focusing on the issues and key points makes the podcast an even greater draw to me and I'm glad I've stuck with it through every installment be it in a more recent box-set binge listening fashion. I did feel that by this stage the team are holding back no punches and we're getting their real feelings and thoughts more than we saw at the beginning of the show and while the hour still doesn't allow for much more than top level analysis it still manages to cover a lot of the bases and the key elements. Still think the Pro's and Khans should be different from discussion points. There have been a fair few memory-joggers along the road and in episode 23 there could have been a fraction more dedicated to the sense of closure that each tale brings (or doesn't) to year one as well as the first shot of a Warbird, the stellar conflicts of politics and religion brought to the fore in Deep Space Nine's finale or the unexpected brilliance displayed in the only first season cliffhanger, Shockwave, from Enterprise. It has taken me a while to fully appreciate this podcast. The road has been bumpy but the team are developing a keener eye for the content and with an ever growing watched back-catalogue it can only go from strength to strength. They've even grown to love Voyager a little - in places - and championed the greatness of the occasionally overlooked Sisko and crew. What didn't work here was the first annual Star Trek Wars aWARds which relied much more on the ratings of each episode than anything else. It was a disappointment and I would suggest adding in some off-the-wall awards for crazy things they're noticed through the season. The ratings winners could be skipped over in a few minutes and this was a chance well and truly missed to wrap up the year in style. However, this won't stop me from downloading the next episode and the first stories from the second seasons which I suspect should be Amok Time, The Child, Homecoming, The 37's and Shockwave, Part II - at least three of which are good episodes. These guys are becoming a regular part of my week and work journey, helping me to reminisce over episodes recently watched and some I still need to revisit. If I was giving them a rating it'd be a Gary Seven. I reckon by the end of next year this could easily be a Seven of Nine. If you're interested in listening to the Star Trek Wars podcast, drop onto the Gone Nerdin' website and download one or two today! 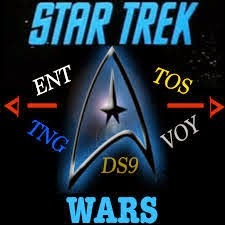 Have you listened to the Star Trek Wars podcast? Have you been enjoying their reviews? It feels as though The Fall has been a big part of my Star Trek reading for a serious amount of time. 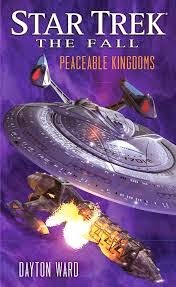 As series' go I've thoroughly enjoyed it although book two was a bit of a low however the later releases were brilliant, especially The Poisoned Chalice so thumbing open Peaceable Kingdoms was going to have a difficult act to follow. If we choose an old cliche, all the chess pieces were set in play ready for the final act. As cliffhangers go I literally closed one book and picked up the next to find out what was happening. So raise your SPOILER alert to RED as we discuss the conclusion to The Fall. While Riker and his activities on Earth are involved in this story, the main focus shifts away from the centre of Federation space to the voyages of the starship Enterprise under the command of one Jean-Luc Picard. Tasked with orders from friend and now superior Will Riker, the flagship commander is out to find the last piece in the puzzle and explain to the reader what the heck is going on. Strangely though the adventure then takes a sharp left and you find that most of the action focuses not on the Enterprise but Doctor Crusher who, along with transport twin Tom Riker become the main protagonists of the piece. It's not something I expected and nor is the direction that the story goes. Beverley certainly holds her own here and turns out something of the hero discovering exactly what is at the core of the mystery although I did feel that her Cardassian doctor friend was a shoe-in for the last book. If he'd been around for a bit longer his impact on the story might have been more weighty than it was having him just in the narrative for book five - but then that's one of the issues of having five different writers turn their hand at a segment in the series. Tom Riker held a significant role in the previous The Poisoned Chalice alongside non-returning (and conspicuous by absence) Nog and Tuvok. 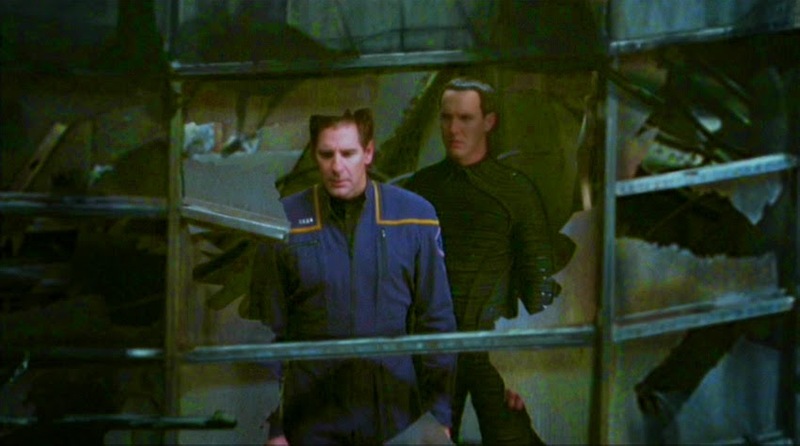 Much more likeable as a character than in his episodic appearances Tom becomes key here too, ensuring the survival of the Enterprise doctor and her plot-device Cardassian friend. This strand of the story is necessary as it fills in the backstory but it does seem to come at the cost of the main conspiracy story around Admiral Riker and the events at Starfleet Command which could have been expanded and made much greater in substance. In fact I never felt that Riker and his associates on Earth were in any depth of danger since the focus was strongly off-world. There is space in the narrative for Picard and crew to fly off and do some investigating work but on the whole this is a lot more ground-based than the cover might lead you to believe. The crew of the Enterprise are placed in a difficult situation but it takes most of the book to get there and when it does, as I felt with the whole of the last section and the effective conclusion, it was over far too soon. From the Enterprise's intervention to the final moments it all swept by so quickly after five books of build up and a final novel in the series which had done so well to explain and detail precisely what it had all meant. The interim presidency of Ishan Anjar following the assassination of Nanietta Bacco has run clean through this story since Revelation and Dust and while each novel has added a different twist to events occurring around that singular moment and thereafter, each has also provided morsels of evidence that something much darker is at work than is at first expected. We've had several possible assassins, involvement of Cardassian separatists, secretive Federation operatives with unknown agendas and even a split within the very membership of the galaxy-spanning organisation itself but Ishan has always maintained a presence. Fortunately we get to see a bit more of the Bajoran pro tem president in the fifth book both in the present and the past which opens up his character but not in the ways that I was expecting. There's a lot more to Ishan than you might think and the part he plays is much less black and white. His approach is logical but the ends and means are perhaps crossed. Of the whole series The Poisoned Chalice was the strongest and provided a much more satisfactory journey towards the conclusion and hinted that the characters within its pages en masse would have more to do with the solution than the majority actually did. Revelation and Dust provided the perfect springboard to the series, placing us at the new Deep Space Nine but then the limelight on those players is swiftly shifted elsewhere and even their reappearances in A Ceremony of Losses doesn't give a lot to the final book. What you do come to appreciate is that while that Ishan story is the anchor that collects the series together this is perhaps looking more to further the cast and expand their horizons. 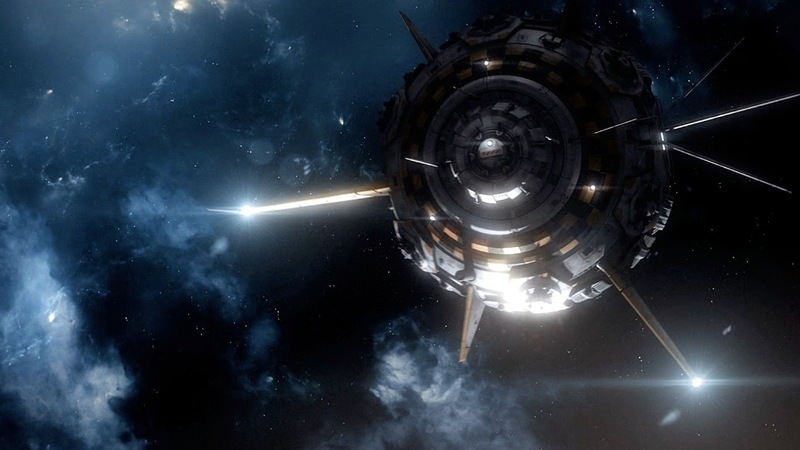 By the end of Peaceable Kingdoms the literary universe is in a very different shape to how it started and not just because it has a shiny new deep space station. 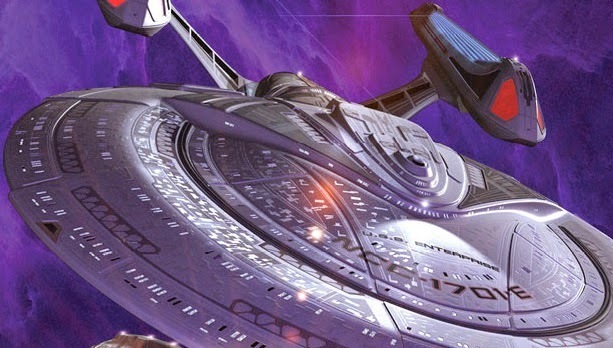 So what does this series mean for the future of the Star Trek universe in novel form? In terms of The Light Fantastic which was the next book to be published, very little, since that focused on Data, Lal and Geordi and avoided any references to the events of The Fall. However there are several loose ends which didn't get nailed down even as Peacable Kingdoms reached its conclusion. 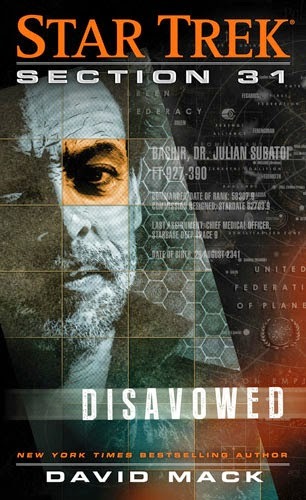 Going back to Book One, Revelations and Dust, what happened to Kira after the experiences she had within the wormhole? That never got answered and for all intents and purposes I guess she's still there. How will having Garak as the leader of the Cardassian people change their role within the Alpha Quadrant? How will he deal with the True Way who have been a constant throughout the series and appear to pose more of a threat to the Federation than the conspicuous Typhon Pact? Then there's the whole issue with Ezri being released from prison with no charges following the events of A Ceremony of Losses and The Poisoned Chalice. Are those events going to affect her command on the Aventine and will they have any repercussions in the future? What too of the new Deep Space Nine? What's going to be different for Captain Ro and her crew? 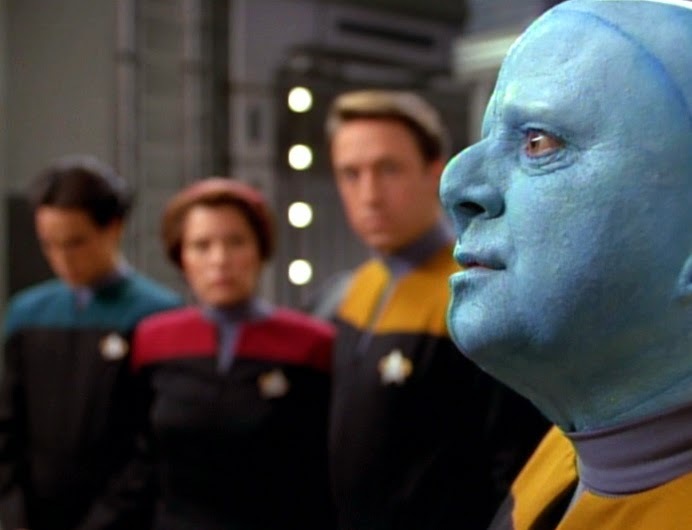 Maybe the biggest question has to be over the future of one Julian Bashir who is still incarcerated following his involvement with curing the Andorian people which might have included delving into some top secret materials. Looking into future releases I believe that we'll have something of an answer to that in an upcoming Section 31 story - more on that as soon as we have a copy. The conclusion, as I noted, is somewhat rushed and not satisfying in the slightest given that I've spent a good few months reading away at the four previous installments, gathering information and building up expectations to a dramatic and jaw-dropping conclusion to be a little perturbed however the announcement that the Enterprise and her crew will be boldly going again on a deep space, long-term mission sounds highly promising and authors looking to dive into the exploits of Picard, Worf and the crew must be rubbing their hands with glee to know that the universe is their oyster and anything can happen. As with Voyager, the unknown will surely bring greater richness to literary Star Trek as we step further into the reaches of space. I swore to myself that I wouldn't get caught up in this debate but sometimes I just give in to temptation. For the past few weeks my news alerts have been filled with the news that William Shatner had been approached to reprise his role as Kirk in the third installment of the rebooted franchise. The world rejoiced and then Shatner promptly said he hadn't been approached - and then backtracked again and said that he had and that he'd be more than happy to do it. For me all the machinations of who told who and who agreed with what and when are by the by but having a couple of weeks to digest the news and step away from the maelstrom has allowed me some time to think about it and I can't say I'm too happy. 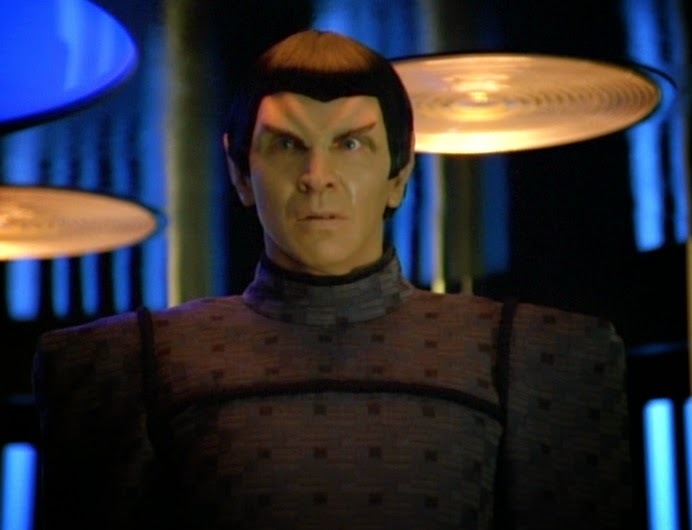 For the past two rebooted movies Abrams has utilised Leonard Nimoy to return as Spock and "bridge" the two universes with his Prime Spock character. In the 2009 movie this worked exceptionally well aside from all the amazing coincidences that occurred around him such as purely by chance meeting both Kirk and Scotty on the same planet (predestination?) and it did indeed help link the two, very different, imaginings of the Star Trek universe. The didn't-know-it-would-happen cameo in Star Trek into Darkness though did feel desperate as if JJ knew this was a bit of a dud and he needed a rock to shore up against. It was unnecessary and if Quinto's Spock hadn't realised that Khan was flippin' dangerous by this stage then he needed relieving of command. In the last 17 months since it was released in cinemas I have a new-found admiration for the second reboot movie and can enjoy it for what it attempts - to be an action-adventure movie for the 2010's but what would a Shatner appearance alongside Nimoy do for the reboot? Personally I think it'll do a lot of damage. OK, Shatner did a skit as Kirk for the Emmy's last year but his final Kirk appearance was back in Generations...followed by Shatner bringing him back for his series of novels in the 90's (The Return, Preserver etc...) and for many, including myself, this is how it should stay. 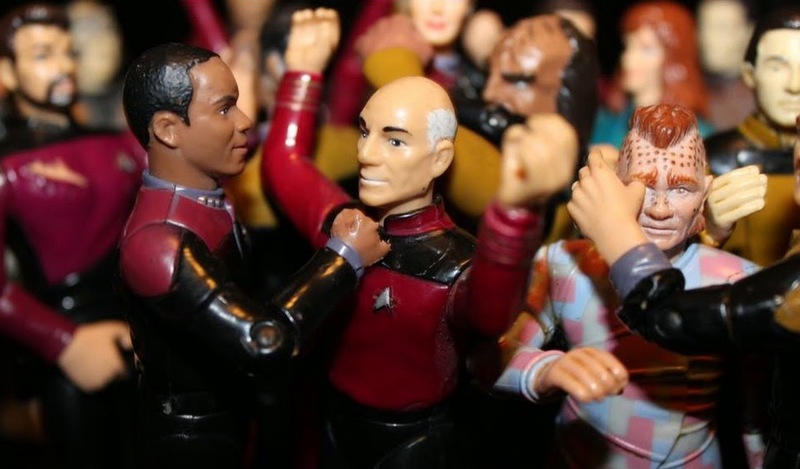 Death in the Star Trek universe has never been that final and in some cases it's been a career move - Scotty died, Worf died, Picard died and all of them came back. There are others that didn't and Kirk should remain one of those. I theorise that because of Shatner's age it could well be a future Kirk from the JJ timeline but who knows. I seriously fear that bringing Shatner in is a way to get bums on seats, make some money and try and appease fans after the disappointment of Star Trek into Darkness and if that's all then it could be more detrimental to the franchise than good. The last decent idea to bring Shatner back into the fold was the mirror universe concept which we might have seen in season five of Enterprise. Archer and the crew would have discovered a planet where all the victims of the Tantalus Field from that alternate dimension ended up including the mirror-Kirk now older but still as angry hence providing a great opportunity to allow Bill Shatner back into the franchise in a sensible and acceptable manner. I would have loved to see that and I genuinely hope it either gets made by Continues or produced as a novel in the Rise of the Federation series (note to Christopher L Bennett.....). Why else would it be bad? Because it's showing reliance on those original actors and I thought that the whole point was to move away from that aspect and let this version of the Roddenberry vision live on its own. OK, The Next Generation, Deep Space Nine, Voyager and Enterprise all had their episodes where there were character crossovers but not every single time. Would this mean Nicholls, Takei or Koenig turning up in Star Trek 4? Another turn by Nimoy? Get your JJ Abrams Star Trek bingo sheet ready to tick off the recurrences. If it's just all hype then great, it's producing interest and seeing as Shatner couldn't let Kirk go after Generations then all credit to making him live once more, even if it's just in people's imaginations. Would there be good reason to get him on screen? Well the fans would go crazy to see the original Kirk in action one more time just as they were about seeing Spock in the 2009 movie or whenever a crossover happens - Relics, Unification, Trials and Tribble-ations...the list goes on and coupled with the 50th Anniversary prospective release date it would go some way to recognising the reboot's origins and making it an anniversary to remember in every way possible. The 25th and 30th were amazing, the 40th not so big but this has to be the celebration to end all Star Trek celebrations. Having Kirk there might just be the icing on that cake. 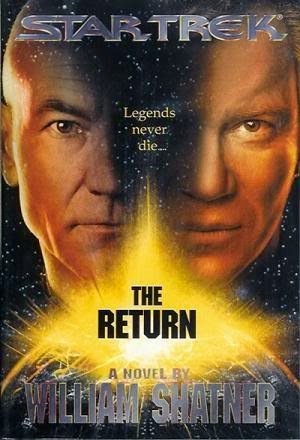 I guess it would have to involve time-travel or a flashback to make it viable - or a new twist on The Deadly Years with an aged Kirk since this third movie is supposed to be more in keeping with the episodic nature of The Original Series. Personally I think that's where it should stay. Use Mr Shatner for publicity, get him to big up the third installment but don't rely on him to make it better. Drop some nice little homages into the script, some Romulans, Talos IV, the phaser rifle from Where No Man Has Gone Before, an M-113 salt vampire, a trip to Bajor, start out in the Badlands or in the Mutara Nebula...there's a ton of material to mine which will make fans just as excited and happy. Adding Nimoy into the last one didn't save it from scathing criticism from fans in fact it only added fuel to that fire. I am sad if William Shatner has sold out for a paycheck BUT I have to assume that he would only do it if the role was considerable and didn't damage his portrayal of Kirk from '66 to '94. Talking of letting characters lie, TrekMovie.com talked to Michael Dorn at Destination Star Trek about the much-vaunted Captain Worf series. It never died and he's still waiting for Paramount to give the word since first writing the pilot back in 2012. 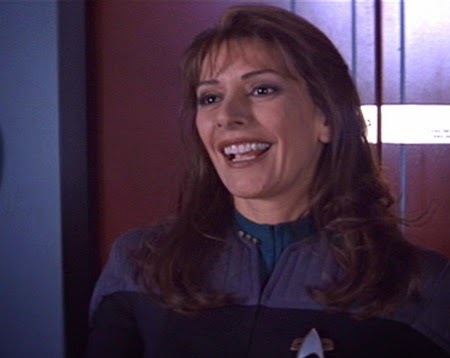 Dorn is looking at potentially bringing back Marina Sirtis, LeVar Burton and even Patrick Stewart for the first episode to send him on his way and there seems to be some traction with fans as nearly 80% of those who answered the poll as part of the article wanted to see a Captain Worf show. I however was one of the minority. This goes back to the whole Shatner/Star Trek 3 argument I've already discussed - things need to move forward, the franchise needs to learn from it's past and strike out as the 2009 movie did and indeed every Star Trek series has attempted since 1987. Be different, be unique. OK, Deep Space Nine nicked O'Brien and Worf from The Next Generation but the others were standing on their own feet from day one. 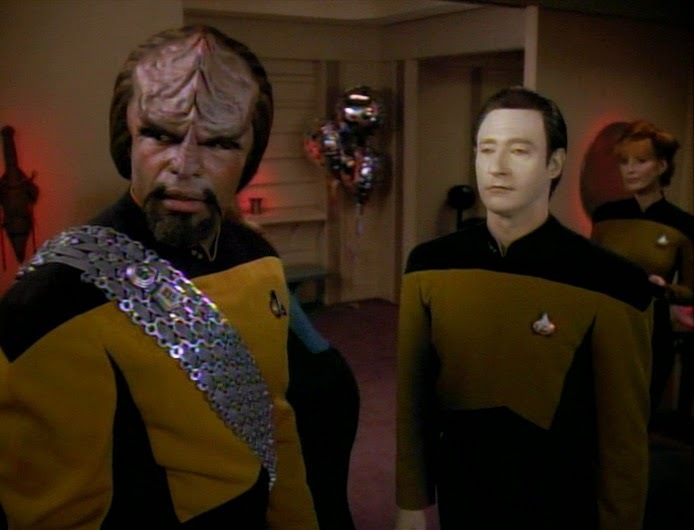 Worf has had an exceptional run of eleven seasons and four movies stretching from 1987 through to 2002. He's the character who's been in the most episodes and that's not bad for a role that was an after -thought for Encounter at Farpoint. A part of me really would like to see a classic character and a much loved franchise actor tread the boards once more and restore us to the Prime Universe but with the current wranglings and focus on the JJ-verse that's STILL unlikely. Paramount might look at such a pilot script but that era is over and gone. We do love it but we have to move on and a new series needs a new approach and a new twist on the classics. Something that adds a new angle to the reboot movies would be fantastic (and would be no doubt a bigger winner and better made than Agents of SHIELD). It would be good as fans, including myself are always wanting to see more about the Prime Universe rather than just reading the next David Mack or Una McCormack novel but how long would it survive, who would be in it alongside Worf? Would we grow tired of the Klingon? Would we just be wanting something to take us back to an era that effectively came to an end over a decade ago? Would you believe that the first episode of this audio series was released back in March 2013? For many months now I've been pestering exec producer George Silsby about when we could expect the release of episode two and each time I've been told to hang-fire, wait, be patient. Now it's finally arrived. Balance has launched. Since that initial release 18 months ago it's been a long journey punctuated by audio vignettes introducing additional characters and graphic novel stories to ensure that the Starfinder name has survived and in many ways has expanded from the pilot. Our review picked out a lot of good stuff within the structure as well as some areas of improvement and since then, there's been a ton of events behind the scenes which have affected projected release dates and forced the team's hand to make some massive changes. "It was actually easy - ideas come easy to me, almost too many ideas," said George in relation to adding in the vignettes; "The overflow of ideas spill into side stories like the minisodes, short stories, and comics. They [the comics] are simply additional side content to enjoy. They will never be required to read to tie into any episodes, but they can enhance the story for those that read them." On the positive side this has meant that a lot more work has gone into the production of not just episode two but also three (previewed at the end of Balance) and four which, we are assured are pretty much ready to go although those Starfinder peeps are holding them back to make sure we get just enough of this long-awaited second episode before we can hear the next stages. From what I know we can expect them before the end of the year. "It was more a case of personal problems myself or the audio engineer had going on behind the scenes, not the actual work that delayed it." said exec producer, George. "We got past our problems, and resumed work, we also had the issue of having to re-record lots of material and re-cast some of the characters coming into episode two. Over the long months these things just kept flip-flopping and that's why we got behind. We finally got our act together and here we are! As we noted time has brought about a few changes within the structure of Starfinder but George seems to be happy with the current status quo; "I now have a "team" and some of the team (from the pilot) left. My new number one, so to speak, is Adrianne Grady who is a talented actress. She voiced characters for Star Trek Online and plays Lt. Valor, she also plays our upcoming female Q in episode five (spoiler!!!). She's a good friend and now my exec." And what about those next episodes? "We are just doing some extra add-on content we call "bookends"," continued George; "Episodes three and four, expertly produced by Michael Medeiros, are woven into a four-part crossover story with our brother podcast Gates of Stovokor also by Busy Little Beaver Productions." There's a lot going on as you can see and the Starfinder team certainly haven't been sitting around twiddling thumbs and playing dom-jot. So what do we think of Balance after one two listenings? Running at a slightly shorter 56 minutes it's a better fit for a single sitting although we have to remember that the first "pilot" episode was feature-length to introduce the many aspects of the Starfinder experience. For me and a commute to work this fitted precisely door-to-door so I can give it a thumbs up if you're looking for some Star Trek to entertain you on the daily voyage. But let's look at it in a bit more detail than that. With the USS Starfinder heading into the Outback there's a lot going on around the ship. Our holographic captain is taking onboard a time-travelling, drunkard Vorta named Kenai who has dealings with the Breen and there are a couple of relationships taking shape too. Key to this episode though and the main story focuses on T'Kayla who was introduced in one of the shorter vignettes last year and has travelled through time to deal with this errant Vorta and help Starfinder stay out of too much trouble. Her presence isn't really explained too well in Balance and I'd suggest you download the earlier additional snippets to get to grips with some of the new arrivals and situations that take place here. It's not a bad thing to have continuing storylines but with Starfinder I can see that there are going to be a lot of threads going on and the more info you can get, the better your understanding will be. Aside from this temporally-challenging story the focus on relationships flourishing is more than I had expected with both T'Kayla/Stark starting off their "thing" in this timeline and Sergeant Byrnes (voiced by exec producer George) also trying his luck with Vulcan security officer Valor. Byrnes, the lead MACO on Starfinder does come across as a little too relaxed and almost comedic which I'm not sure totally suits the character however the twist that he puts in as part of his romancing technique did raise a smile and I look forward to seeing how this gets developed over the coming episodes since we know (thanks to T'Kayla) that they will become an item and start a family. Nothing like a good bit of pre-destination to make you raise the game. 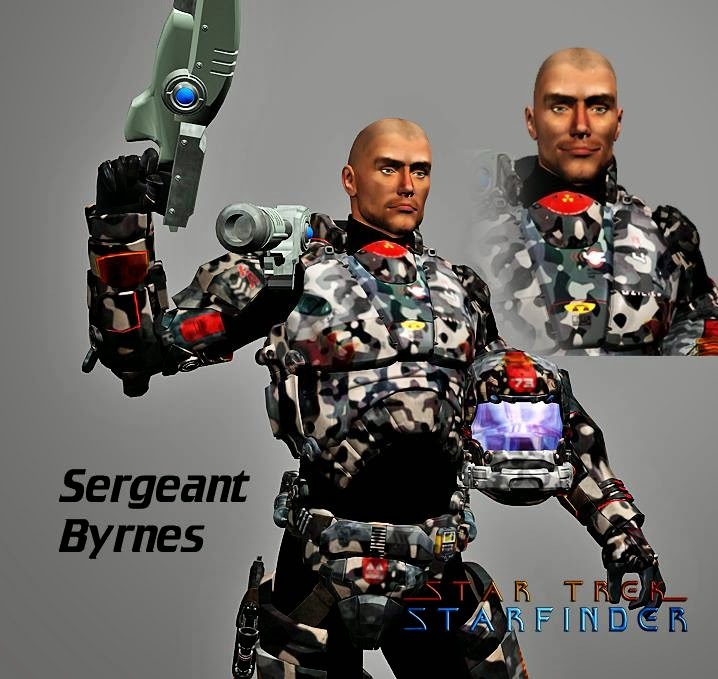 "I'm biased over Sgt Byrnes because I play him," noted George; "but that's because he represents the "soldiers" that never got to exist on the show before Enterprise, I feel they represent a unique and interesting part of Starfleet. I also love writing the Vortas, the whole cloning line is full of opportunity to mine for stories, I like all the characters, really." The Vorta character reminded me somewhat of Keevan from Deep Space Nine's Rocks and Shoals thanks to the slightly slimy and flippant nature of the voice used to portray him. He annoyed me to hell which was perfect as the role was one that didn't require one to like him at all. While this is very much a character building episode it does feel that it's in the middle of something with a lot more to give. The conclusion, which does have a couple of nice little twists in it, does seem to be over fairly quickly and the end credits roll (with the addition of an episode three preview). The pilot was very action packed, pretty well-paced and here, Balance is a lot more relaxed and in that respect shows off that Starfinder isn't a one trick pony. There's more depth to it and we get a lot more layers added to the background rather than heading off into a Star Trek Online style shoot'em-up. While that first episode was very choppy in places, attempting to introduce and set up a whole host of new and diverse characters, here we have more time to explore certain individuals than just get a sharp bio and a few lines. The Outback too has been set up to be a weird area of space and I look forward to seeing this expanded upon in future episodes as here we've got familiar faces such as the Breen, Vorta and Cardassians showing up to play off against the Starfinder. "I have a very set story arc and sub-arcs mapped out for all of season one; the minisodes are the random ideas made live as we go." confirmed Starfinder creator George, "The story is the start of two arcs--a shadow war between Section 31 and the Department of Temporal Investigations and a new temporal war. It just sort of gelled from the start as the next story to begin." On the side of audio quality it's still obvious that different cast have used different equipment to record their parts to then be spliced together by George. The inclusion of background noise into the scenes does help to detract but the tone change between actors makes it clear that they are using different equipment - it's a shame but probably unavoidable and I wouldn't want this to stop anyone from listening. 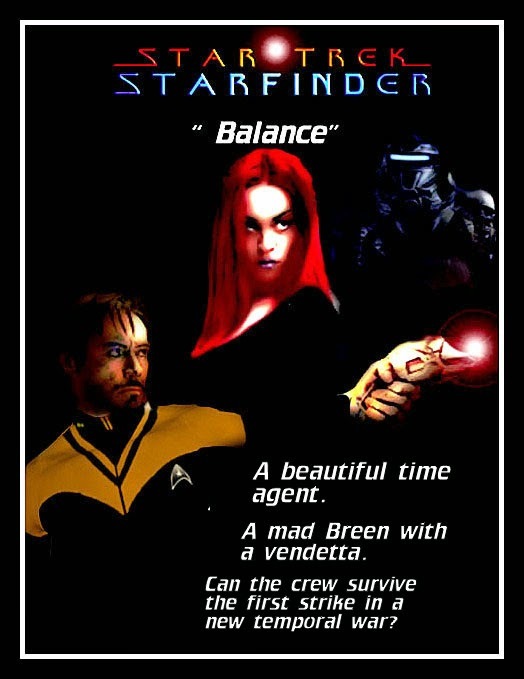 Having an audio series of Star Trek isn't something new but in the era of blogs and podcasts wishing to critique the show or fan films taking us in new directions, is Starfinder the right way to go, after all it's based on the online Star Trek universe? "As a genre, audio series are underestimated and I feel we can help change that. it's a unique format of storytelling that goes back to the days of radio plays before TV came out. I've been very happy (with episode two) as the feedback and traffic for it has dwarfed episode one by a mile. If I had to change anything i'd have split up the number of romances begun in this episode (SKoST: I agree!)." Looking ahead, I hope that this slower pace isn't a sign of things to come and that subsequent episodes regain the pace, potential and edge that the pilot showed 18 months ago. There's also some great little references to a certain timelord (Captain Hartnell for one) which are fun to look out for and one thing we haven't mentioned at all is the ominous mention of The Choir and the War Monks, both of whom we will be coming up close with in the near future. I am reassured by George here that this is all actually going somewhere and not thought up on the spur of the moment - there's a Big Plan, a mission and a vision. with this resolve I can see that the future for Starfinder is certainly bright and optimistic. 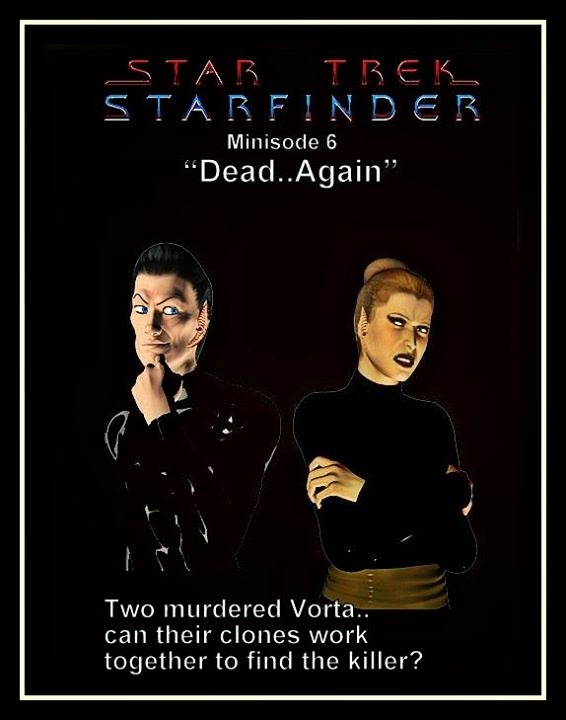 Further to that, there's a new minisode coming out which takes a new twist on the Vorta (intended to be with us for Halloween if not before) and more graphic novel material is on the way. Having heard the teaser from episode three (at the end of episode two and also available at the Starfinder website on its own) I'm curious if nothing else. 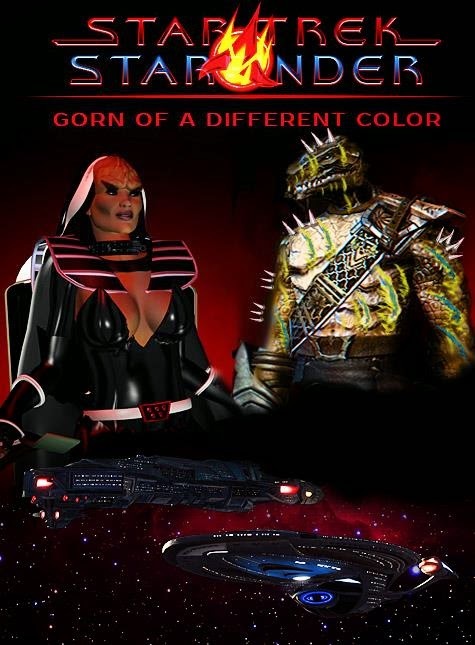 As with all good teasers it tells you absolutely nothing but sounds enticing.To top that off I was very privileged to get a chance to hear an exclusive clip from episode three, Gorn of a Different Colour and what I can say about that is Klingons, Klingons and Klingons. It promises to be very different, take the action away from Starfinder and expand upon the mystery and happenings within the Outback. Beyond that I was sworn to secrecy about the events of episodes four and five but what I can say is that this is going to be worth keeping up to date with and following as the story unfoldsin the next few months. I don't even question if this will all make sense because we know that the eleven episode first season is mapped out. That must be some map. Episode Two of Star Trek: Starfinder is available now for download or streaming via the Starfinder website right now. You can also locate their minisodes, graphic novels and episode one to catch up on all the events taking place in and around this new chapter in the Star Trek universe. Have you listened to Balance? What were your favourite parts? What are you hoping for with episode three and the two-part arc? Drop us a note below! Tipping Point: When Did Sisko Ramp It Up?